The Mark VII was originally equipped with either Goodyear Eagle GA or Michelin MXV4 Energy tires. The size was P225/60 R16. The specific designation for the stock Goodyear GA tire was P225/60 R16 97V. All the stock wheels, no matter what the style, were 16 inch diameter 7 inch wide. The cars are designed for the stock tires. In fact most new cars like the Mark VIII are designed from the ground up for a certain brand and type of tire. The suspension is tuned for that specific tire. 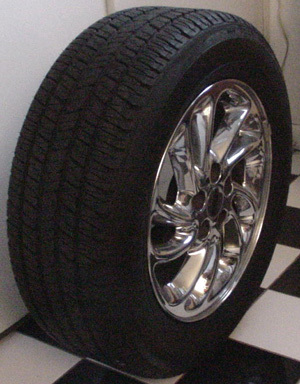 The tire that is on the Mark VIII is a Goodyear Eagle GA specifically designed for the Mark VIII. It differs from the Eagle GA on the Lexus SC400 and from the generic Eagle GA sold in most tire shops. You can put on a lower profile tire, and get better steering response and handling because sidewall flex is reduced. You lose some of the softness in the ride though. Your speedometer will be off because of the reduced diameter of the tire.If the profile is very low you also at greater risk denting the rim on bumps and potholes than with high profile tires. Tires slightly wider than stock can work, but this is mainly for aesthetics. The contact patch is not increased significantly enough to affect traction or performance. Handling may actually suffer due to increased sidewall flex. Stock tires are the best compromise for handling and ride.